Now that the world has had a chance to watch Sailor Moon Crystal this weekend, everyone seems to have something to say about the new reboot. Some stuff is positive, which is unsurprising, given how beloved the franchise is. And some stuff definitely has a tinge of disappointment to it. Regardless of how you feel about the reboot, one thing is clear: lots of people are watching. That's just how influential the franchise is. 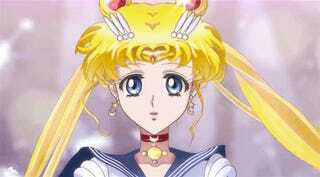 I found myself watching even though I wasn't that huge on Sailor Moon growing up. Here's what the internet had to say about Sailor Moon Crystal. Someone even did the painstaking work of comparing frames for certain characters from the old and new Sailor Moon anime. One of the biggest subjects had to be the animation—particularly its quality, and the range it afforded the anime. Most folks seem to agree that the animation for Crystal seems poor, which is unfortunate. Personally, while Usagi's new figure sort of weirds me out, I recognize that debating a character's body like this is also strange and uncomfortable. I also saw a lot of talk about Tuxedo Mask floating around—in particular, the uselessness of his new "disguise." And yes, people are making lots of videos. Phew. What about you, how did you react to the first episode of Crystal?